More will be noted regarding spring (March–May) conditions later in this report. First taking a look at May, New Jersey experienced its 9th wettest on record, with observations extending back to 1895 (Table 1). The statewide average rainfall of 6.62” was 2.63” above the 1981–2010 average and the wettest May since 1990. Frequent clouds and rain resulted in many chilly days, however, a mid-month heat wave was impactful enough such that the average statewide temperature of 59.8° was only 0.7° below the 1981–2010 average. It was the 61st coolest May of the past 123 years, with none cooler since 2008. Table 1. 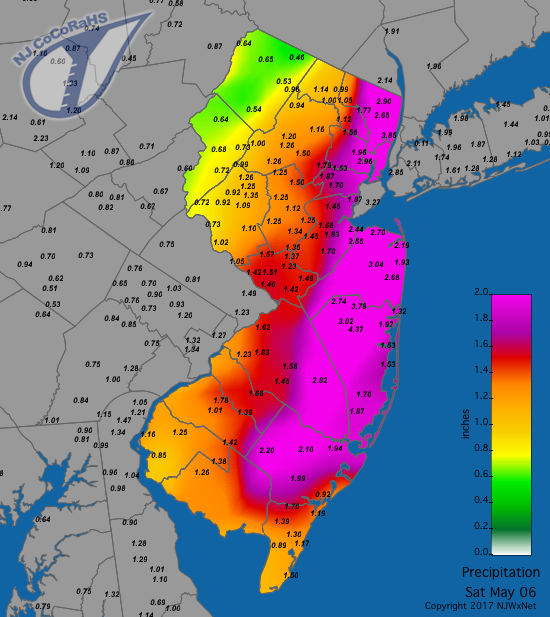 The ten wettest Mays across NJ since 1895. As is often the case, local monthly precipitation totals varied widely across New Jersey in May. Six CoCoRaHS observers emptied more than 10” of rain from their gauges. These coastal locations include Lacey Township (Ocean County) with 10.70” for the month, Berkeley Township (Ocean) 10.50”, Howell (Monmouth) 10.39”, Stafford Township (Ocean) 10.11” and 10.09” (two stations), and Manchester Township (Ocean) 10.11”. Eleven locations saw 9.00”–9.99” and 21 received between 8.00”–8.99”. These totals are 200%–250% of normal. On the other hand, several northern locations received close to average May rainfall. These include 3.87” in Andover (Sussex), Blairstown (Warren) 3.88” and 4.62”, Oakland (Bergen) 4.08” and 4.70”, and Liberty Township (Warren) 4.51”. There were eight events during the month when rainfall exceeded 0.50” somewhere in NJ, with five of these having maximum values exceeding 1.00”, four over 2.00”, and three over 3.00”. At times, this resulted in local flash flooding and some minor stream and river flooding. The first storm began early on the 5th and exited NJ before dawn on the 6th. The heaviest rain fell in the eastern third, with the least over Sussex and Warren counties (Figure 1). Manchester took top honors with 4.38”, followed by Howell 4.19”, Palisades Park (Bergen) 3.91”, Jackson Township (Ocean) 3.78”, and Colts Neck (Monmouth) 3.58”. Of the 221 NJ CoCoRaHS reports, 35 exceeded 2.00” and 160 were between 1.00”–1.99”. Vernon Township (Sussex) saw the least with 0.52” and Liberty Township received 0.58”. The worst flash flooding of the month occurred in the urbanized northeast corner of the state, closing roads and requiring the rescue of some motorists. Some pop up thunderstorms followed this event during the afternoon of the 6th. Pea size hail was reported in Bergen County, the only area to see notable rain, which amounted to 0.58” at Haworth, 0.57” in Ramsey, and 0.47” in River Edge. Figure 1. Rainfall between approximately 7AM on May 5 and 7AM on May 6. Observations were gathered and reported by CoCoRaHS observers. Another storm invaded NJ late on the 12th into the early hours of the 14th. It contributed an impressive statewide soaking, with every one of the 215 CoCoRaHS observations exceeding 1.00”. Totals of 2.00” or more were mainly found in Monmouth and Ocean counties, with 64 stations exceeding 2.00”. They were led by 3.82” in Lacey Township, 3.60” at Lavallette (Ocean), Harvey Cedars (Ocean) 3.58”, Sea Isle City (Cape May) 3.36”, and Berkeley Township 3.26”. The remaining 151 locations caught between 1.05” and 1.99”, with the lowest total observed at River Edge, followed by 1.13” in Wantage (Sussex). There was some minor coastal flooding during this event resulting from high tides exacerbating drainage difficulties for the heavy rainfall. As with the previous storm, remnant atmospheric instability resulted in some rain squalls and scattered thunderstorms during the afternoon of the 14th, especially in central and northern areas. These fast-moving storms deposited just a few tenths of an inch of rain at best, with Freehold (Monmouth) catching 0.57” and Frenchtown (Hunterdon) 0.54”. However, they brought rice to nickel-size hail to multiple locations, such as Denville (Morris), Wantage, Randolph (Morris), Franklin Township (Somerset), and East Brunswick (Middlesex). Tragically, strong winds brought down a branch at a gathering in Passaic (Passaic), killing one individual and injuring six others. Trees and wires also fell at locations in Bergen and Union counties. Interspersed within all of the month’s wetness, a wildfire consumed 296 acres of the Pine Barrens in Shamong Township (Burlington) on the 20th. The fire erupted despite recent rains, in part due to the desiccating heat of the 17th–19th (covered later in this report). Fortunately, there were no reported injuries or structural damage. Yet another soaker arrived in south Jersey early on the 22nd, lasting through the afternoon. Two Hammonton (Atlantic) stations caught 3.22” and 3.10”, followed by 3.05” in Buena Vista (Atlantic) and 2.95”, 2.92”, and 2.84” at three Stafford Township locations. This time, only the area southeast of the lower end of the NJ Turnpike up to and including Monmouth County received greater than 1.00”. Totals tapered off to the northwest, where Vernon, Wantage, and Montague townships (Sussex) each saw only 0.07”. Rain spread from south to north during the predawn hours of the 25th, bringing mainly light rain and drizzle through the day, until heavier rain and some thunderstorms arrived into the early hours of the 26th. In a reversal from the previous event, this time the heavy rain was confined to the region northwest of the NJ Turnpike. The largest totals were found in Hunterdon County, with Flemington at 2.31”, Lebanon Township 2.17”, 2.14”, and 1.98”, and Clinton 2.25”. The least rain fell in River Edge at 0.42”, Wildwood Crest (Cape May) 0.52”, and Brick (Ocean) 0.55”. Persistent onshore winds brought some minor to lower-end moderate flooding along the south coast. The evening of the 28th into midday of the 29th (Memorial Day) saw cool and damp conditions pervade NJ. The south and central coast and far northwest areas caught more than 0.50”. This included Cape May County totals of 1.41” and 1.22” in Lower Township, 1.21” in Middle Township, 1.18” in North Wildwood, and 1.14” and 1.15” at Ocean City. Washington Township (Morris), Harrison (Hudson), and Kearny (Hudson) each saw only 0.10”. The 30th was a day with showers and drizzle that persisted into the predawn of the 31st. Demonstrating the scattered nature of the rain from this event, top totals included Buena Vista 0.65”, Montague 0.63”, Wantage 0.62”, and Middle Township 0.61”, while Brick, Belmar (Monmouth), and Ewing (Mercer) received only 0.03”. A few severe thunderstorm cells popped up over central and northern NJ on the evening of the 31st. While, at best, only a few tenths of an inch of rain fell, pea-size hail, with a some oblong shaped stones exceeding quarter size, fell in Flemington, and pea or smaller hail was reported in Long Hill (Morris) and Franklin (Sussex). The highest barometric pressure of the month was reached on the 21st, with most locations reading between 30.35”–30.40”. The lowest was on the 6th, with the barometer hovering near 29.35” across NJ. Wind gusts equaled or exceeded 40 mph on eight days in May at one or more NJ Weather Network (NJWxNet) stations. Seaside Heights (Ocean) started things off with a 40 mph gust on the 1st. The 2nd found gusts of 43 mph at High Point Monument (Sussex) and Stewartsville (Warren), 42 mph in Pittstown (Hunterdon), 41 mph at Kingwood (Hunterdon), and 40 mph at Silas Little (Burlington). The Monument reached 41 mph on the 3rd. Gusts on the 5th got to 43 mph at Sea Girt (Monmouth), Harvey Cedars, and High Point Monument, and 42 mph in Seaside Heights. Fortescue (Cumberland) topped out at 40 mph on the 7th. The 13th–15th was the windiest period of May, beginning with Seaside Heights up to 46 mph, Sea Girt to 42 mph, and Harvey Cedars at 41 mph on the 13th. The 14th saw High Point Monument reach 55 mph, Seaside Heights 46 mph, and Harvey Cedars and Logan Township (Gloucester) each 41 mph. The Monument topped out at 53 mph and Seaside Heights 40 mph on the 15th. As often occurs during seasonal “swing” months, extremes in temperature were notable this May, ranging from 28° to 96° across NJ. On seven days, one or more of the 67 NJWxNet stations exceeded 80°, while temperatures in the 20°s or 30°s were experienced on 11 days. The 1st was the lone warm day in the first half of the month, with the thermometer up to 86° in Sicklerville (Camden) and 85° at West Deptford (Gloucester). Onshore breezes off the cool ocean kept the maximum to 66° at Harvey Cedars. Temperatures above 80° were next experienced on the 16th, with 82° achieved at Haworth, Hawthorne (Passaic), and Wayne (Passaic). The season’s first heat wave began on the 17th. A heat wave is defined as maximum temperatures of 90° or higher on three or more consecutive days at a given location. Toms River (Ocean) topped out at 94°, with seven stations at 93° and 32 between 90°–92°. Harvey Cedars only made it to 70°. The 18th was the warmest day of May 2017. Hawthorne reached 96°, Haworth and Toms River 95°, and 53 other stations topped out from 90°–94°, while a southerly breeze off Delaware Bay kept the maximum at Fortescue to 79°. The 19th was almost as hot, with 94° reached at Moorestown (Burlington), Hawthorne, West Creek (Ocean), and Toms River. Highs of 90°–93° were observed at 44 other stations, with Fortescue again the least hot at 80°. What made the 19th most impressive were the elevated minimum temperatures. New Brunswick (Middlesex) and Toms River only got down to 73° and 28 stations had lows from 70°–72°. The New Brunswick reading was the earliest occurrence of the year on record (1896–present) of a minimum equaling or exceeding 70° and only the fifth time a 70° minimum has been observed in May. The previous early 70° record was May 24, 1902, and the earlier previous 73° or higher minimum was on June 4, 1943. Warmth disappeared quickly on the 20th, not to return until the 25th, when Piney Hollow (Gloucester) reached 81°, though the maximum that day at High Point Monument was a chilly 55°. Enough sun broke through the clouds to bring highs of 82° in Hamilton (Mercer) and 81° at both Moorestown and Pequest (Warren) on the 31st. Persistent clouds, drizzle, and an easterly wind resulted in a meager diurnal temperature range throughout NJ on the 30th. Only Stewartsville and Hawthorne, each with highs and lows of 63° and 54°, had a range as large as 9°. Meanwhile, Seaside Heights and Oceanport (Monmouth), each with highs of 59° and lows of 55°, reported a state-minimum range of 4°. All but one of the 11 May days with minimums in the 30°s or lower occurred from the 3rd to the 14th. Walpack (Sussex) and Pequest fell to 35° on the 3rd. The 4th was the coldest May morning, with Walpack at 28°, Berkeley Township 29°, Pequest 30°, and Basking Ridge (Somerset) 32°. Some 31 other NJWxNet stations were between 33°–39°, with Atlantic City Marina (Atlantic) mildest at 53°. High Point Monument and High Point (Sussex) were 37° and 38°, respectively, on the 7th. The Monument was 33° and four stations 34° on the 8th. Walpack fell to 31° and Berkeley Township and Kingwood (Hunterdon) reached 32° on the 9th. While extremes were not as cold on the 9th compared to the 4th, more stations (37) were between 33°–39° than on the earlier date. The 10th found Walpack and High Point Monument down to 38° and Berkeley Township 39°. The last freezing temperature of the season occurred at Walpack on the 11th, with a low of 32°, and 16 stations between 36°–39°. Walpack fell to 33° on the 12th. High Point Monument had a minimum of 39° and maximum of 45°on the 13th, each the lowest in New Jersey on that day. The Monument was again 39° on the 14th. The last May reading in the 30°s was 39° at Walpack and Berkeley Township on the 21st. The duration of the freezing season from last fall through May ranged from a maximum of 228 days at Walpack to a minimum of 116 days at West Cape May (Cape May). Walpack had its first freeze on September 26th and last on May 11th. West Cape May first fell to the freezing mark on November 28th and last froze on March 23rd. The March through May period saw an average of 14.46” of rain and melted snow deposited across New Jersey. This is 2.37” above the 1981–2010 normal and is the 16th wettest spring back to 1895. Both March and April were close to normal but just on the dry side, thus the entire positive spring departure is the result of the wet May. The March report discusses the only spring snow seen across NJ, which was rather impressive up north. Spring temperatures averaged 51.6°. This is 0.8° above normal and ranks as the 21st warmest on record. This included the first sub-normal month since May 2016, the warmest April on record, and the below-average coolness of May.